WSNs connected to the Internet through 6LoWPAN have wide applications in industrial, automation, health care, military, environment, logistics, etc. An estimate by Bell Labs suggests that from 50 to 100 billion things are expected to be connected to the Internet by 2020 , and the number of the wireless sensor devices will account for a majority of these. Generally, the applications can be categorized into four types: event-based, continuous, query-based and hybrid applications based on the data delivery method [2, 3]. In the hybrid application type, the first three categories are combined into hybrid application, i.e. sensor nodes send packets in response to an event (event based) and at the same time send packets periodically (continuous) as well as send a reply to a sink query (query based). This type of application will be common in the future as WSNs are integrated with the Internet to form the IoT . In the IoT applications, the sensor nodes host many different application types simultaneously (event based, continuous and query based) with varied requirements. Some of them are real-time applications, where the application data is time-critical and delay-constrained, while others are non-real-time applications. Some applications send very important data and losing this data is not permitted, e.g. medical applications and fire detection applications. This brings new challenges to the congestion control algorithms and mechanisms designed to be aware of application priorities as well as node priorities. 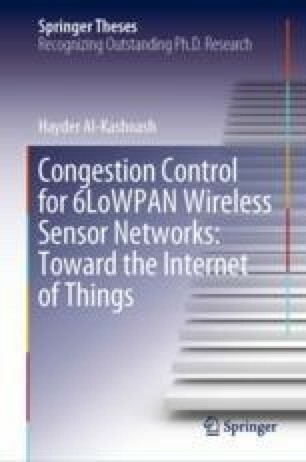 However, according to our best knowledge, none of the existing congestion control literature in WSNs and 6LoWPAN networks supports awareness of both node priorities and application priorities. To address this, later we define a ‘priority cost function’ to support node priority awareness and distinguish between high-priority nodes and low-priority nodes.